I don't know if I've mentioned it but we have only one car that works. So if I need to do anything (like doctors appointments) and Chris can't come along we all have to get up at 4 in the morning and take daddy to work, not so fun. But Alison really likes picking daddy up. Here she is watching the stairs waiting for daddy to come out of his office. we drove home and Alison wanted to play on the playground for a bit in her new rain coat that Grandpa Gary and Grammy sent. And going down the slide! This is her first time going down the slide all by herself at our building's playground!! Hi! 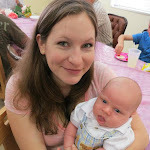 I'm Meredith and this is my blog "2 cats and a baby" Since I created this blog the cats have gone and the baby is a toddler and a new baby has entered our lives! I hope you enjoy reading about our life. I love hearing from you so please follow and leave comments!